Happy Tablescape Thursday everyone! Couldn't skip this chance to share a couple of pretties I picked up on our anniversary trip to Savannah last week. I spotted the large glass cloche at Paris Market, but wasn't sure until a smaller cloche at another store was almost twice as much. I've been on the lookout for another cloche ever since I gave away the only one I had to my daughter for her bedroom. The other little pretty I found were these cute little birdie salt and pepper shakers in the little metal basket. Found them at Villa Savannah on Broughton Street across the from Paris Market. Now for the table setting: The salad plates which are my "good" (formal) china are Limoge, Artois green; the white dinner plates are Gorham Breckinridge. The iced tea glasses are vintage "Boopie"(Berwick) by Anchor Hocking. Flatware is by Wallace, but not sure of the pattern. The cakestand and little white pitcher are from HomeGoods. The crocheted doily is a vintage treasure that my grandmother made many years ago. Lovely table -- love your china! Congratulations on your anniversary! I'm so glad you enjoyed your trip back to Savannah and that you were able to find such fun things!!! How on earth did you get that cloche back in one piece?!?!?! :-) Your "good" china is just beautiful. I love the design...very petite. Thus the name of the post, huh? :-) It's so sweet that you used the doily your Grandmother made. What a nice Mother's Day weekend nod!!! Enjoy your weekend, and once again, congratulations on your anniversary! What a pretty table! 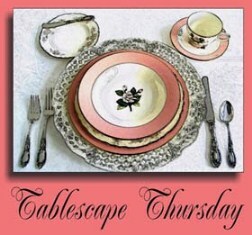 I love, love, love your china pattern -- and the placesetting really shows it off beautifully. The centerpiece is a great mixture of a vintage treasure and new finds! Lovely table and the china is beautiful.I have some of my grandmothers crochet pieces-need to get them out and use them. That cloche is beautiful! How clean and simple! One more reason Savannah was well worth the trip! Have yourself a very Happy Mothers Day! Beautiful table...Your chargers look so much like the ones I just purchased from Ikea...love them....Such a beautiful setting for a meal!!! Love your view! loved the arrangements on the table !